The Customers may login with their registered account and check out their shopping cart. The Customers can give their shipping address, which may be different from the address in their profile. In Billing Details, the user can check a box to indicate that the delivery address and billing address are the same. This will help them skip the delivery section and finish their purchase faster. If the delivery details are different from the billing details the customer can enter this information in a form in this section. The Customers can opt for cash on delivery option and make the payment when they receive their order at their door step. The Customers can always log in to their account and edit their name, change email address, edit phone number and change password any time. The Customers can create a profile with their address. They can always edit this address. The Customers can see the list of their placed orders along with the order ID and amount. Spurtcommerce is a responsive solution. Today, most of the Customers prefer to shop on their Mobile phones. The solution offers an easy way for developing a Mobile App for your business by using an API. The Customers can provide a keyword and search for a product they are looking for, in the search list page. The Customers can use filter options in the search list page to find exactly what they are looking for. The filter options can be based on price range, color, brand name, and so on. The Customers can click on a particular product and navigate to the product page to view complete display of the product, along with descriptions, offers and discounts that are applied to that product, and so on. The Customers can add the product to their Wish list or directly into their Cart for check out. The Customers can avail various facilities pertaining to Customer services like Contact us and sitemap. Access to all the information about Brands, Special offers, Banners, and so on. The Customers can subscribe for newsletters for receiving them on a periodic basis. The solution has an option for featuring specific products on the home page. The featured products are shown based on the products that the Customers are searching for. It may change periodically as the manner of the search changes. The product image can be displayed under the title on the left-side, along with alternate views of the product below that in smaller boxes. 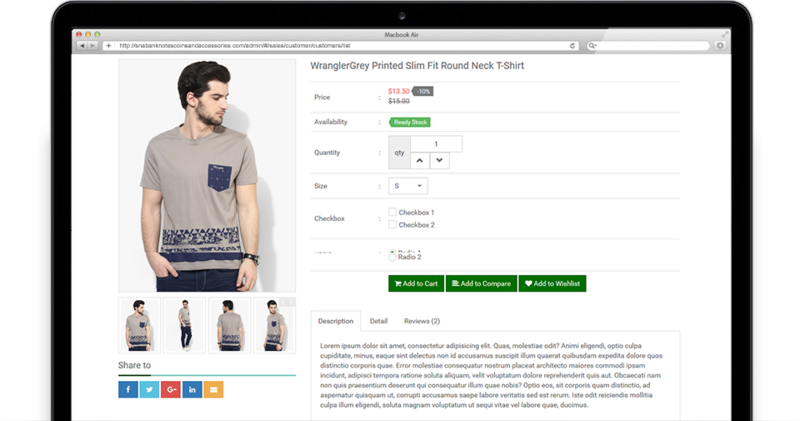 Clicking on the main image will make it bigger within the window for the Customer to have a closer look into the product. The Customers can keep track of recently viewed products, in case they want to go back and view the product again. The website will show related products to the Customers, which they may be interested in buying along with the product they are planning to buy. The Customer can get their purchased products delivered at their door step. On integrating with the Payment gateway, the Customer selects their method of payment here, which will navigate them to the payment gateway. This will be the last step and the Customer can see an overview of their purchase; including the product description, quantity, and price (with tax & shipping). The Customers can keep track their orders right from dispatch till delivery, by providing their order ID. So, let’s build something to fascinate your Customers.